Greetings. 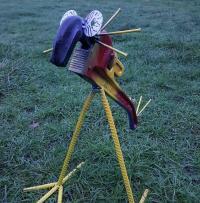 I retired and started creating art from scrap metal objects. If you have old rusty tools, garden tools, Steel scuba tanks, automotive parts or even sheet metal of (most) any kind, I would love to pick it up. I don't haul or sell scrap. Instead, I attempt to keep it out of our landfill and create something fun with it. You can search ThanesWorld of Interesting Things on Facebook to see some examples. https://www.facebook.com/ThanesWorldofInterestingThings/ Thank you!